The latest designer colors could be coming to you soon courtesy of… tarantula hair? Researchers at the University of Akron are interested in spider hair. 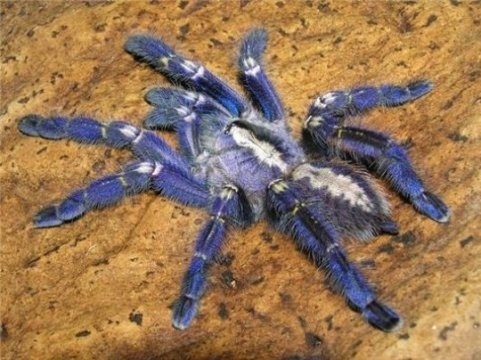 Specifically, the hairs of the Metallic Blue Ornamental tarantula. This giant spider gets its name from its vibrant color. But this color doesn’t come from a pigment like most colors. It actually comes from microscopic structures on its hairs that look like flowers! When light hits these structures, blue colors shine bright. Scientists have been working on replicating this. But you could only see the blue at certain angles. The researchers wanted to mimic these flowery structures. Using a 3D printer, they were able to achieve brilliant colors of their own. No matter what angle you look at it, it’s always blue! And by simply changing the size of these printed flowers, they could change the color! Most of these colors could be used in textiles or cosmetics. And it’s a whole lot easier than wearing a tarantula. Uggh!